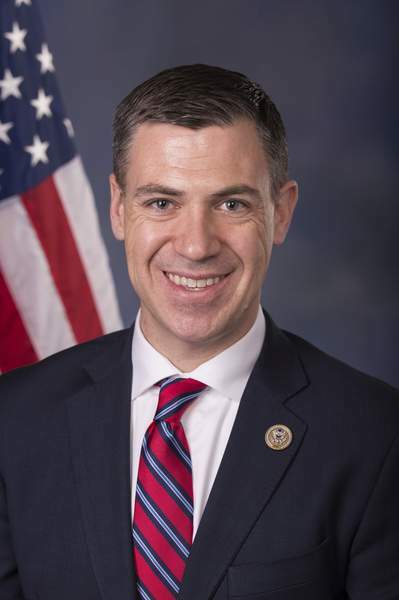 U.S. Rep. Jim Banks praised Republican House Speaker Paul Ryan on Wednesday for advancing conservative causes – as well as for helping raise Banks' profile as a freshman member of Congress. Banks said that Ryan, who announced earlier in the day that he will not seek re-election this year in his Wisconsin district, "deserves an enormous amount of credit, if not most of the credit" for legislation enacted late last year that cut income taxes and increased military sending. "What he has accomplished to reverse the tragic and significant cuts to our military in and of itself might go down in history as his biggest accomplishment," Banks, R-3rd, said in a telephone interview. Banks also pointed to Ryan's support for legislation restricting access to abortion. "I believe he'll go down in history as the most pro-life speaker of the House we've ever had, which is important to me as well," Banks said. Ryan visited a private gathering of Republican leaders in Fort Wayne last May in part to thank Banks for voting in favor of a bill to repeal and replace the Affordable Care Act. The bill failed to advance in the GOP-controlled Senate. "I've enjoyed a great relationship with the speaker. ... He was enormously helpful to me when I pursued the House Armed Services Committee appointment. He was a critical part of supporting me to get on that committee, so I'm very grateful to him for that," Banks said Wednesday. The lawmaker from Columbia City said he is not concerned that, with Ryan's announcement, 37 House Republicans do not seek re-election this year, including a dozen who are running for the Senate or governor. "With these 2-year election cycles, it's a natural part of the process," Banks said of the House churn. "I see that as only a healthy part of the process to elect new leaders. I consider myself still a new voice and leader on Capitol Hill and look forward to being a part of the new generation of leadership." Even before Ryan's announcement, many political analysts were predicting Democrats will win the majority of House seats in the November election. "One can hardly imagine a more obvious signal that Ryan fears the prospect, if not of losing his own seat, than of losing the majority and hence his speakership," Washington Post opinion columnist Jennifer Rubin wrote Wednesday. Banks dismissed any notion that Ryan was surrendering to a possible Democratic wave. "Historically, the party of the president loses a number of seats in the first mid-term election. While I don't think that has anything to do with the number of retirements, it is a historical trend. But we have a lot of strong Republicans running in contested races," he said. Republicans have a 237-192 advantage in the House. There are six vacant seats. Banks is unopposed for the GOP nomination in northeast Indiana's heavily Republican 3rd District. In the general election, he will face a Democratic nominee from a primary election field of party-endorsed Courtney Tritch and perennial candidates John Roberson and Tommy Schrader. Banks said it is too early to say whom he, if re-elected, might vote for to take over for Ryan as the top GOP leader in the House. "I'm looking for a conservative choice who is ardent in their pro-life beliefs like Speaker Ryan has been, who wants to focus on the big issues of the day like reforms to mandatory spending to drive down the national debt rather than continuing to see it rise," he said. "And someone who will continue to place emphasis on keeping a strong military and focused on our national defense as well. Those are the three criteria that I'm looking for." Vice President Mike Pence, a former congressman and governor from Indiana, said Wednesday in a statement that Ryan "was instrumental in enacting President Trump’s agenda" and "has been a fierce defender of our military, a leader in ushering historic tax reform through Congress, and a public servant with a heart for helping lift up the less fortunate." Sen. Todd Young, R-Ind., who served in the House from 2011 through 2016, said in a statement that Ryan "is a true leader whose thoughtfulness will be missed on Capitol Hill. He genuinely cares about every American, and we share a belief that conservative ideals will help improve the lives of even our most marginalized populations."